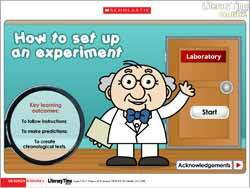 This on-screen resource allows children to practise sequencing skills in a practical, scientific context. They are invited to select equipment and sequence instructions for a floating and sinking experiment. They can then carry out a virtual trial experiment on screen and record predictions and results. This resource is ideal for use before carrying out a real experiment on floating and sinking. Children can work individually or in pairs to support discussion.